What are genlock, framelock, & timecode sync and when do I need them? 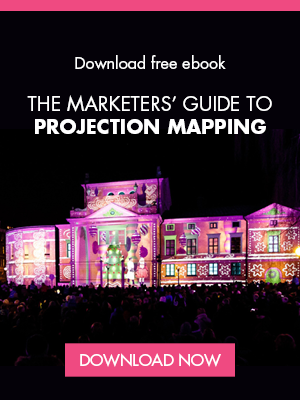 In the world of professional video and audio production, maintaining a synchronized signal across multiple units, such as video cameras, screens, LED walls and multi-projector installations can be the difference between success or… disappointment (putting it mildly!). So how can you synchronise the video signals coming out of different sources? 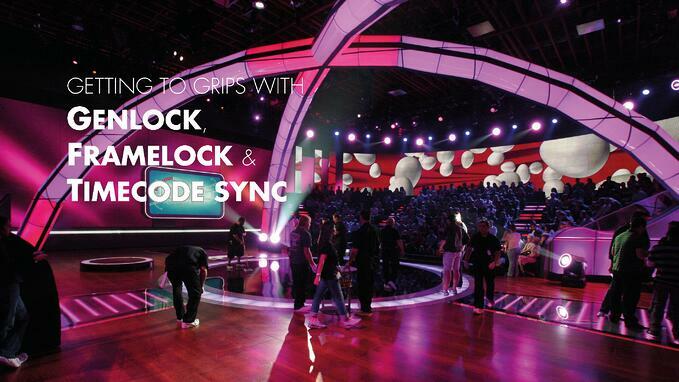 In this blog, we take a look at genlock, framelock and timecode sync. When do you need to lock a device with others? Whenever we talk about large, multiple display systems, it is important that the video frames and signals are synchronized with all the available video sources. A single lag can result in a delay of video output in the display screens. Signals need to be synchronized among all the output video sources and that means locking a device with others. Genlocks, generator locking, is the technique is used to synchronize video signals, coming out of a signal generator or similar source, to the other picture resources. Genlock technology is widely used in video applications as it has the potential to mix video images and computer graphics. 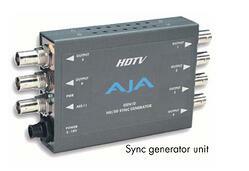 One of the most common genlock applications is to synchronize cameras. The example unit shown here implements a pulse which is used to create frames inside the camera. This pulse further sends a signal to inform all the devices to capture frames simultaneously. In a scenario where you have multiple projectors or a large LED wall, you need to synchronize the output signals from the playback system (often a media server, such as a WATCHMAX from Dataton). A synchronized output will ensure a high quality image and a flicker-free and tear-free image. When videos and movies are shown across multiple display screens, it's crucial that all the screens display frames simultaneously. Framelock helps in creating a virtual canvas in which the image continuity is maintained across all the screens. It involves the use of multiple hardware resources. From a 3D stereoscopic perspective this locking is a critical aspect. The timecode can be defined as a list of numeric codes, which are generated at a uniform interval of time with the help of a time synchronisation system. If we are required to synchronise multiple cameras, video or audio recorder, we generally implement timecode. Genlock is used to sync video signal or pixels to an external synchronisation source whereas framelock is used to sync the frame rate of a video source to an external synchronisation source. In the case of genlock, while synchronising the SDI output to an external source, the SDI refresh rate is determined with the help of a sync source. With framelock, the SDI refresh rate is determined with the help of valid modes. These modes are displayed in the output video format list. Quadro G-Sync II, along with the Quadro FX 4600, Quadro FX 5600, Quadro FX 4800, Quadro FX 5800, Quadro 5000. Quadro Plex 1000 (Model: I, II and IV) along with the Quadro Plex 2200 D2, or Quadro Plex 7000. Frame synchronization can be defined as the way to synchronize display pixel scanning to a synchronization source. During this process, the multiple display systems are synchronized with each other by transmitting a synchronization signal from a master system to all the other systems in the entire network. This process is accomplished with the help of a frame synchronizer. See timecode as a clock which counts in frames. These clocks can be synchronised so that the timecode values are identical on each device, connected electronically, or synchronised and run independently. Synchronization can be defined as the process of merging the audio signals with video signals or frames with the pixels of the video source. Also, you can sync lights, visuals, SFX to the signal resource. Broadcast TV studio: Broadcasting can be defined as the process of transmitting audio as well as video content with the help of an electronic communication medium, as in radio and television. Video wall with multiple display servers: A video wall is generally a setup that is comprised of multiple monitor screens, video projectors, or TV sets. You can use LCD panels, direct view LED arrays, blended projection screens, laser phosphor displays, and rear projection cubes. Live shows with multiple media servers: Live shows like concerts, stage shows, or events implements media servers to broadcast its live coverage. The media server can be defined as a dedicated server which is responsible for processing the playback of video, still images and other creative compositions as well as being integrated with equipment such as audio and lighting consoles. Lead image: This archive still is from the set of "Minute to Win It", USA. WATCHOUT production by Background Images.